Human skin is subject to a variety of common benign growths, but most never require medical attention. Management (or lack thereof) requires an appreciation of how such growths appear and behave, coupled with the ability to differentiate them from more serious entities. This article provides a selected compilation of the more common benign growths that affect the skin. Seborrheic keratoses may be the most common benign tumor of the skin. Typically, they are scaly (hyperkeratotic), brown (hyperpigmented), often somewhat greasy plaques that vary in size and thickness and often appear to be stuck onto the skin surface (Fig. 1). They occur on any surface except the palms, soles, and mucosa. They are common in adults, more so with advanced age, and unusual in children. Their cause is unknown, but a genetic predisposition may be present in some families. 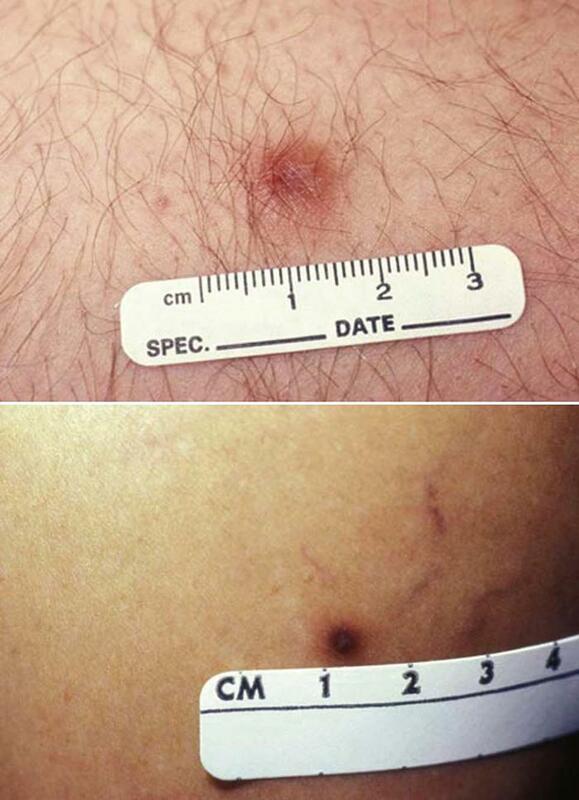 The sudden eruption of many, often pruritic seborrheic keratoses on the trunk (Leser-Trélat sign) has been implicated as a cutaneous marker of internal malignancy, commonly gastric adenocarcinoma. Evaluation of such patients should include upper endoscopy and age-appropriate cancer screening. Therapy is usually not necessary unless plaques are pruritic, irritated or inflamed, or of cosmetic concern. When necessary, cryotherapy (liquid nitrogen) or curettage is usually adequate. If the clinical diagnosis is uncertain, a biopsy is warranted. 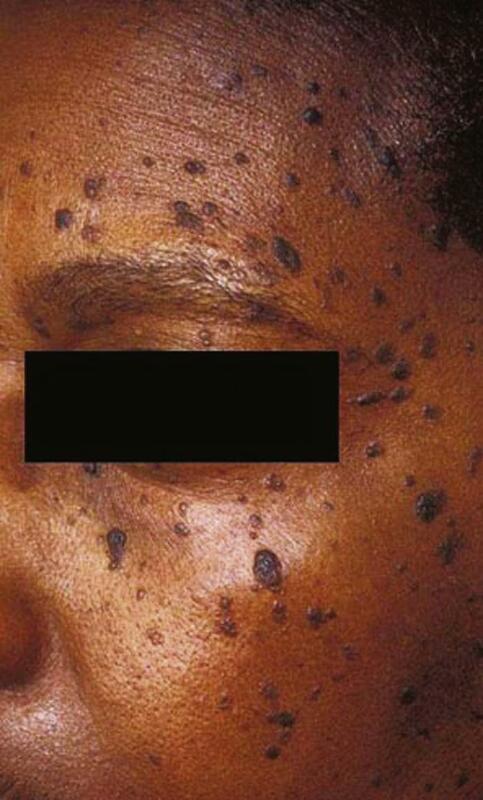 Dermatosis papulosa nigra is a condition of hyperpigmented, hyperkeratotic plaques similar to seborrheic keratoses and acrochordons (skin tags), both clinically and histologically. 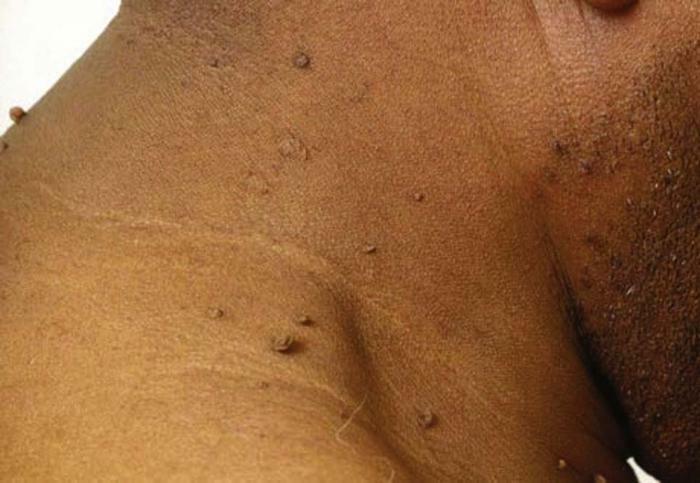 Dermatosis papulosa nigra growths are common and usually are found on the face and neck, with a particular predilection for periorbital skin of darkly pigmented persons (Fig. 2). Approximately 50% of the black population has these benign growths, and women are more affected than men by a ratio of 2 : 1. Therapy is usually not necessary unless the growths become itchy or irritated, although many people desire treatment for cosmetic reasons. Treatment options include scissor excision, curettage, or cryotherapy, all of which can produce hypo- or hyperpigmentation. Sebaceous hyperplasia is a benign enlargement of sebaceous glands surrounding a follicle characterized by small flesh-colored to yellow papules, often with a central dell, on the face of adults (Fig. 3). 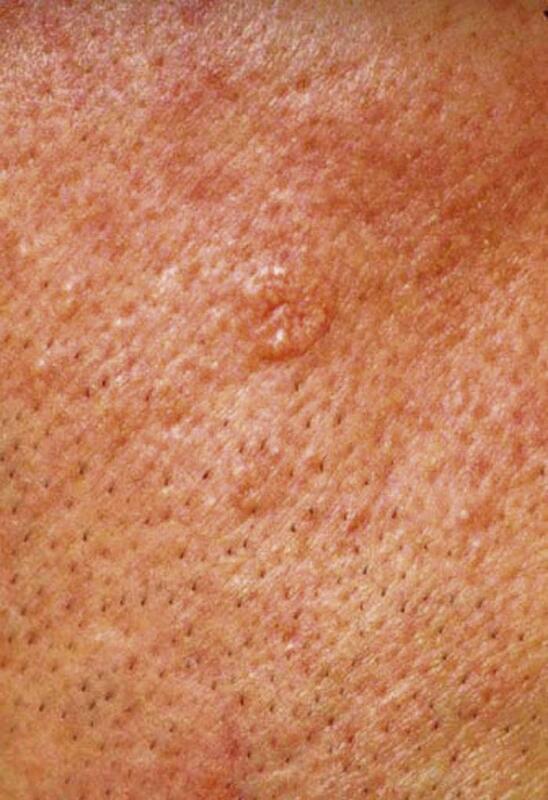 More common in men and in patients with organ transplants, sebaceous hyperplasia lesions are often numerous, and individual papules can resemble basal cell carcinomas (particularly when accompanied by telangiectasias) or even molluscum contagiosum. Treatment, primarily for cosmesis, includes cryotherapy, curettage, and laser therapy. Ephilides are small, discrete, hyperpigmented macules on the sun-exposed skin of fair-complected individuals, usually redheads and blonds. Ephilides are not growths per se; they represent focal increased melanin in the skin, and they tend to darken in the summer with increased sun exposure and lighten in the winter. When present in large numbers, they indicate excessive sun (photo) damage and an increased risk of sun-induced skin cancer, including melanoma, basal cell carcinoma, and squamous cell carcinoma. Ephilides are benign and harmless, and treatment is not necessary. Topical bleaching creams, chemical peels, or cryotherapy can lighten ephilides of cosmetic concern. 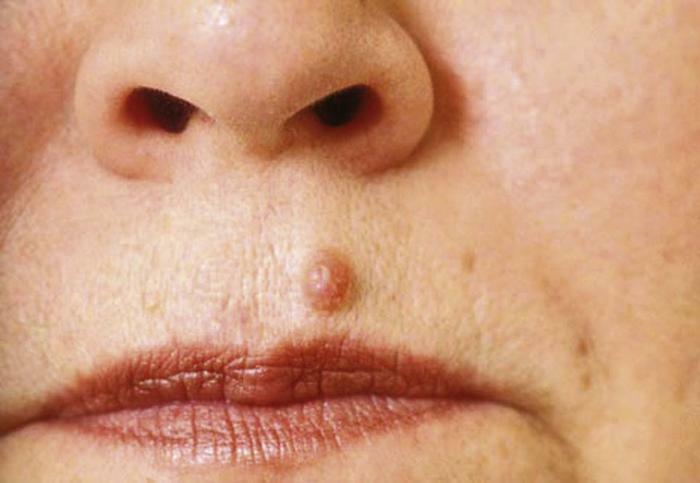 Lentigines are hyperpigmented macules or patches that can resemble nevi (moles). Usually pale tan to brown, they typically appear in white adults and increase in number with advancing age (Fig. 4). Lentigines tend to occur on the sun-exposed skin of the face, neck, upper trunk, forearms, and hands. Unlike ephilides, lentigines are the result of epidermal hyperplasia and of variable proliferation of melanocytes and subsequent melanization. Lentigines are benign, but they occasionally transform into lentigo maligna (superficial melanoma). If change occurs in a lentigo (e.g., rapid growth, change in color or surface contour), a dermatologic evaluation is warranted and a biopsy may be necessary. Many lentigines indicate excessive photodamage and increased risk of sun-induced skin cancer. Like treatment for ephilides, treatment for lentigines is primarily for cosmetic reasons. Options include cryotherapy, chemical peels, laser therapy, and bleaching creams containing hydroquinone. Nevi are common benign growths, usually hyperpigmented or skin-colored macules, papules, or small plaques, probably derived from proliferating altered melanocytes (nevus cells). Age, race, and genetic and environmental factors (primarily sun exposure) all contribute to the development of nevi for any particular patient. Nevi can develop anywhere on the body and usually declare themselves by the early adult years. Most nevi are categorized by histologic subtypes: junctional, compound, or intradermal. 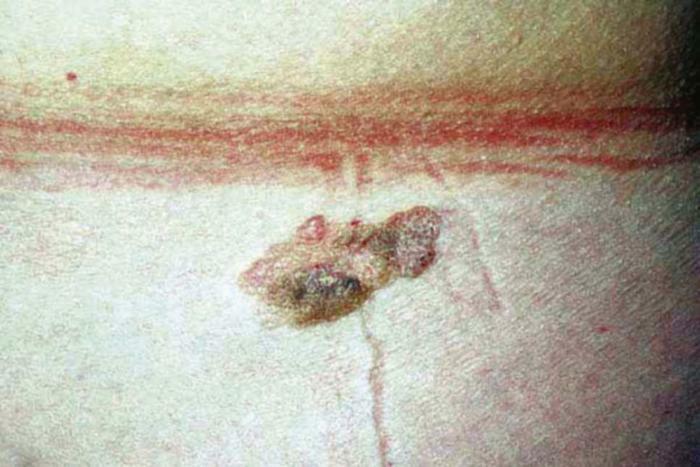 Junctional nevi are hyperpigmented macules composed of nevus cells located in the epidermis (Fig. 5); compound nevi are hyperpigmented papules composed of nevus cells in both the epidermis and dermis; and intradermal nevi are brown to flesh-colored soft papules with nevus cells confined to the dermis (Fig. 6). 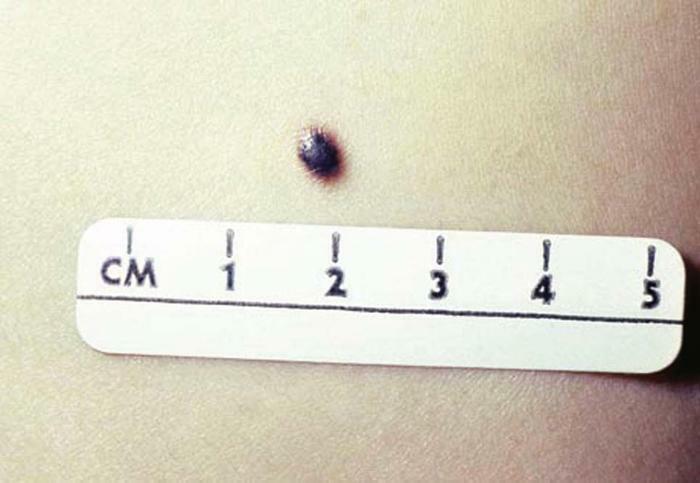 The blue nevus is a well-circumscribed, blue-black, dome-shaped papule commonly mistaken for melanoma. Blue nevi are collections of nevus cells, melanocytes, and macrophages containing melanin in the dermis. They are most often found on the dorsal surfaces of the hands and feet (Fig. 7). 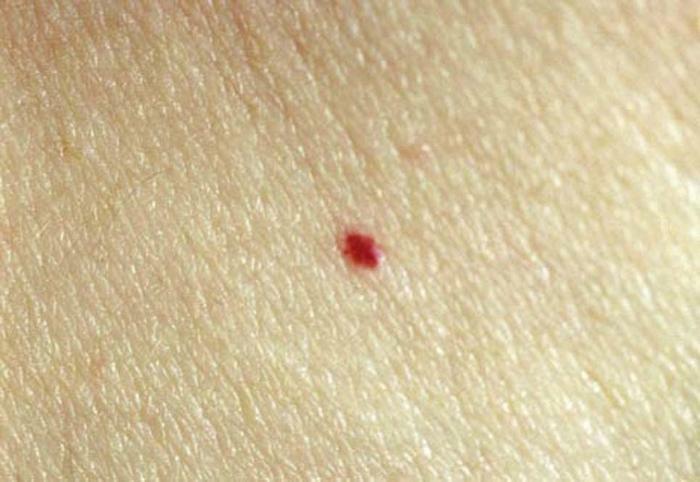 Some nevi may be atypical (dysplastic), perhaps portending melanoma. Signs of atypia or perhaps even melanoma include Asymmetry, irregular Border, uneven or multiple Colors, and large Diameter (>6 mm). These features constitute the ABCDs of melanoma. If such features are present, a dermatologic evaluation is warranted, and a biopsy may be necessary. An excisional biopsy is preferred to allow histologic evaluation of the entire lesion. 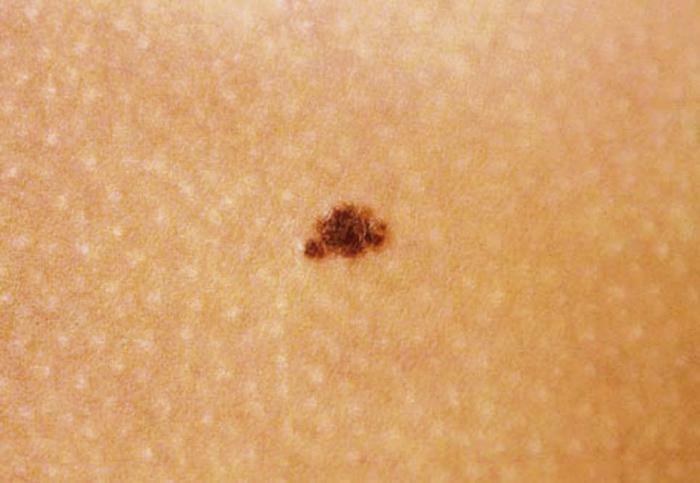 Persons who have many atypical moles often have a family history of atypical nevi and might have a family history of melanoma. Such persons have an increased risk of melanoma and deserve a regular dermatologic evaluation in addition to regular self examinations. Cherry angiomas are ubiquitous benign vascular growths, usually small red papules or macules, that occur in adults and increase in number with age (Fig. 8). Angiomas can appear anywhere on the body but tend to be more common on the trunk and proximal extremities. They are invariably asymptomatic but can bleed with trauma. Treatment is not necessary, but laser therapy is the most successful means of destruction for cosmetic purposes. Dermatofibromas are firm papules or plaques with a dusky red to brown color. They are most commonly found on the extremities (Fig. 9). With palpation, they often seem to retract, giving the dimple sign. Dermatofibromas are benign tumors of fibroblast and histiocytic origin that can follow trauma. They are usually asymptomatic but occasionally are pruritic or irritated. When indicated, therapy involves intralesional corticosteroids or simple excision. Acrochordons are pedunculated flesh-colored to brown soft papules commonly found in intertriginous areas such as the neck, axillae, and groin (Fig. 10). Increased numbers of acrochordons tend to occur in obesity and pregnancy. Occasionally, acrochordons twist and strangulate their blood supply, resulting in pain or irritation, or they become irritated from clothing or jewelry. Treatment with simple snip excision is usually adequate. Lipomas are benign, soft, mobile tumors of fat that vary in size from a few millimeters to 10 centimeters or more (Fig. 11). Lipomas are characterized by slow growth, with eventual stabilization and little tendency to involute. They are usually solitary and asymptomatic but may be painful if they entrap or compress nerves or if they contain thrombosed vessels (a variant termed angiolipoma). Some familial syndromes exhibit numerous lipomas, such as Proteus syndrome and Gardener's syndrome. A lipoma overlying the sacrum of an infant can indicate an underlying spinal abnormality, a situation that warrants radiographic evaluation. Treatment, when desired or necessary, is either excision or liposuction. 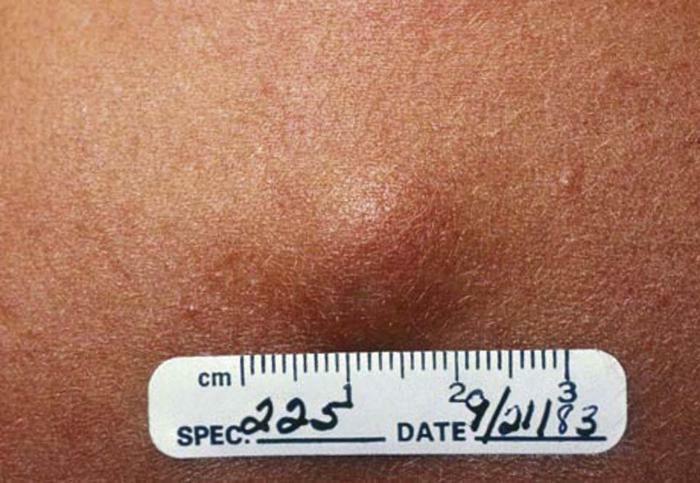 Epidermal inclusion cysts (EICs) are flesh-colored, firm nodules with a central punctum, usually found on the face or upper trunk of adults (Fig. 12). The central punctum is the follicular opening from which the cyst is derived. As the name implies, EICs evolve from fully differentiated squamous epithelium trapped in the dermis with accumulation of keratinaceous debris. “EICs” on the scalp are actually pilar cysts or trichilemmal cysts and can be distinguished histologically. The presence of many EICs is occasionally associated with syndromes that have other dermatologic and internal implications, such as Gardener's syndrome. Unless the cyst ruptures, EICs do not require therapy. When they do rupture, inflammation and pain occur that warrant treatment with incision and drainage, warm compresses, and often intralesional corticosteroids and even systemic antibiotics for secondary infection. In that scenario, excision is usually recommended after the inflammation subsides. Milia are asymptomatic small white or yellow papules that occur primarily on the faces of women and newborns. These cystic collections of keratin just under the epidermal surface can also occur with porphyria cutanea tarda and other blistering diseases. Treatment is usually for cosmetic reasons and consists of incision followed by expression of cystic contents. Topical tretinoin may help to treat and prevent milia in affected persons. Pyogenic granulomas are solitary, often pedunculated, erythematous papules or small nodules that are often friable and bleed easily with minor trauma. Sites of predilection include the fingers, face, and lips (Fig. 13). Pyogenic granulomas develop rapidly (over the course of several weeks), and the sudden occurrence can be quite alarming to the patient. They probably represent a reactive neovascularization, potentially in response to injury. 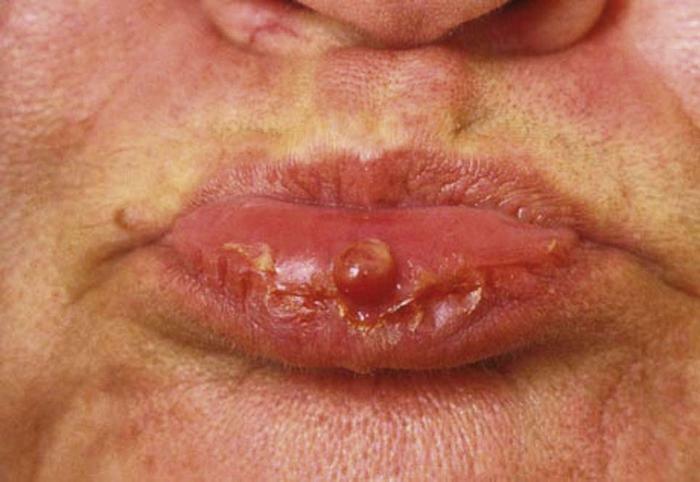 Pyogenic granulomas are common in pregnancy; termed granuloma gravidarum, they usually arise on the gingival mucosa. Treatment options include curettage, deep shave excision with fulguration of the base, complete excision, or laser ablation. Recurrence is common, especially after incomplete removal. Most skin growths are benign and harmless, but differentiation from malignancy is essential. Certain benign growths can indicate a systemic condition, including hormonal disorders. Most benign growths do not require treatment unless they produce symptoms. 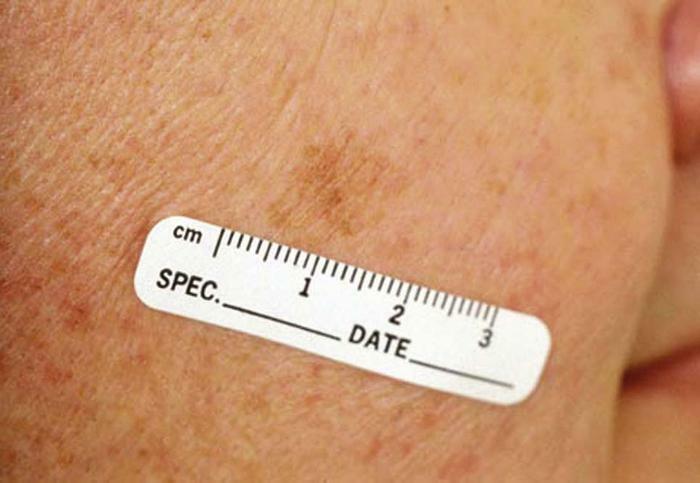 A skin biopsy may be needed to evaluate lesions that have changed or that display characteristics of cutaneous malignancy. Pariser RJ. Benign neoplasms of the skin. Med Clin North Am. 1998, 82: 1285-1307. Silver SG, Ho VC. Benign epithelial tumors. In: Fitzpatrick TB, Freedberg IM, Eisen AZ, et al (eds): Dermatology in General Medicine. 6th ed. New York: McGraw-Hill, 2003, pp 767-785.